Bill Tschudy was born in 1935 in Highland, Illinois. He enlisted in the U.S. Marine Corps Reserve on April 11, 1958, and attended basic training at MCRD Parris Island, South Carolina, from July to October 1958. Pvt Tschudy then completed aircraft mechanic school at NATTC Jacksonville, Florida, in December 1958, followed by service as an aircraft mechanic at NAS Dallas, Texas, until he joined the U.S. Naval Reserve on November 15, 1961. 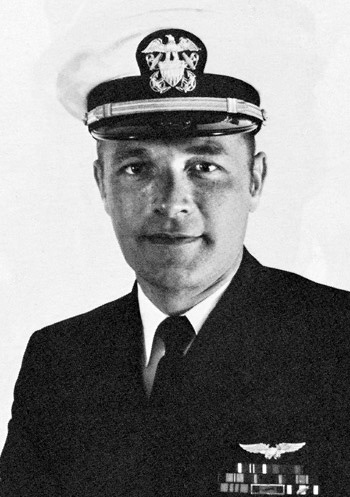 He went on active duty for Naval Flight Officer training on March 10, 1962, and received his commission as an Ensign and designation as a Naval Flight Officer in March 1963. Ens Tschudy then attended A-6 Intruder bombardier/navigator training with VA-42 at NAS Oceana, Virginia, before serving as an A-6A bombardier/navigator with VA-75 at NAS Oceana, and deployed aboard the aircraft carrier USS Independence (CV-62) until he was forced to eject over North Vietnam and was taken as a Prisoner of War on July 18, 1965. After spending 2,767 days in captivity, LCDR Tschudy was released during Operation Homecoming on February 12, 1973. He was briefly hospitalized to recover from his injuries, and then received an assignment to complete his master's degree at the University of Pennsylvania. His next assignment was as Head of the Appropriations Committee's Liaison Office in the Office of Budget and Reports in the Navy Comptroller and Fiscal Management Division at the Pentagon from January 1976 to June 1978, followed by service as Executive Assistant to the Deputy to the President and to the Dean of Academics at the Naval War College in Newport, Rhode Island, from August 1978 until his retirement from the Navy on August 1, 1981. For conspicuous gallantry and intrepidity while interned as a Prisoner of War in North Vietnam. In February 1966, his captors, completely ignoring international agreements, subjected him to extreme mental and physical cruelties in an attempt to obtain military information and false confessions for propaganda purposes. Through his resistance to those brutalities, he contributed significantly toward the eventual abandonment of harsh treatment by the North Vietnamese, which was attracting international attention. 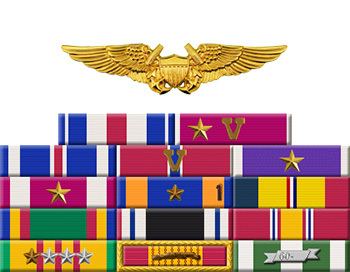 By his determination, courage, resourcefulness, and devotion to duty, he reflected great credit upon himself and upheld the highest traditions of the Naval Service and the United States Armed Forces.